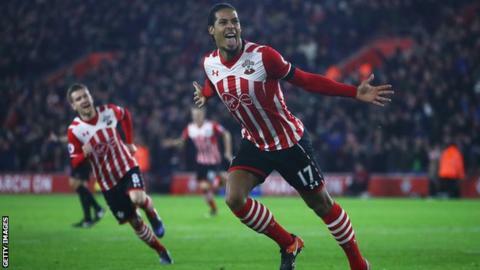 Liverpool have apologised to Southampton over "any misunderstanding" and ended their interest in defender Virgil van Dijk. Saints had said they would report Liverpool to the Premier League over an alleged illegal approach for him. The 25-year-old centre-back is wanted by a number of clubs and had stated his preference for a move to Anfield. Liverpool manager Jurgen Klopp had made signing the Netherlands international a top priority. "Liverpool Football Club would like to put on record our regret over recent media speculation regarding Southampton Football Club and player transfers between the two clubs. The £50m-rated defender signed a new six-year contract last year, having joined Southampton from Celtic for £13m in September 2015. Premier League champions Chelsea and Manchester City have been heavily linked with the player, but City's interest had cooled as they were not prepared to pay as high a fee as Liverpool. Van Dijk missed the final five months of the season after sustaining an ankle injury following a challenge by Leicester City's Jamie Vardy in Southampton's 3-0 win at St Mary's on 22 January. It forced him to miss Southampton's EFL Cup final loss to Manchester United at Wembley.